After a much better night's sleep and a much better day at work, I came home to a happy smiling krewe. We ate pizza and played a couple of Rock Band jams. 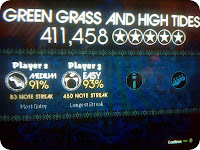 Some new records on Green Grass And High Tides: high score of 411, 458, and a 450 note streak for me. It's good to be able to rock, again.